Commonly known as HTV, iron-on vinyl, heat press vinyl, heat transfer vinyl and t-shirt vinyl. So you want to buy heat transfer vinyl, but you don't know where to start. 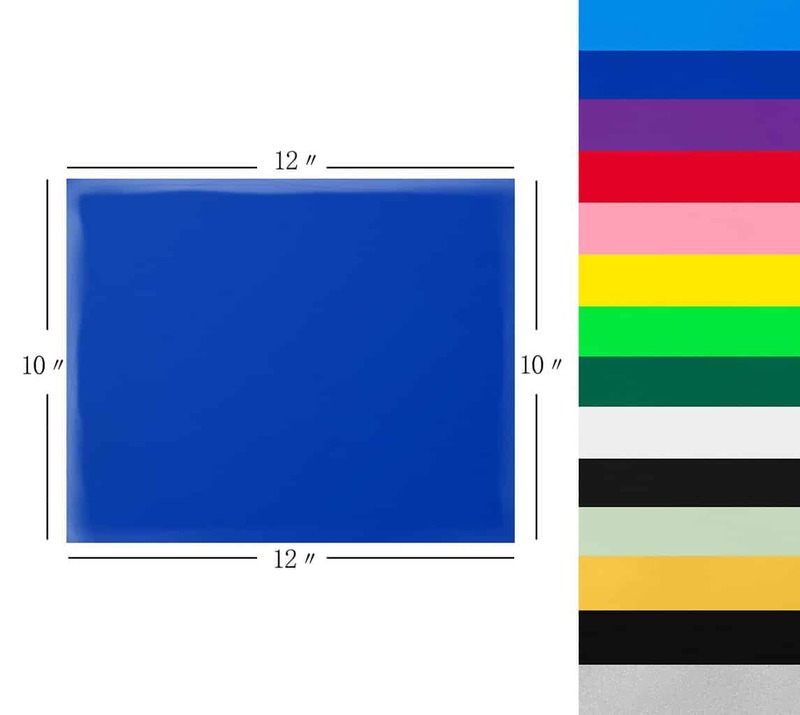 With countless options of heat transfer vinyl on the market in 2019, it can be overwhelming to find a quality brand that is not only affordable and reliable, but one that also come in a range of colors. 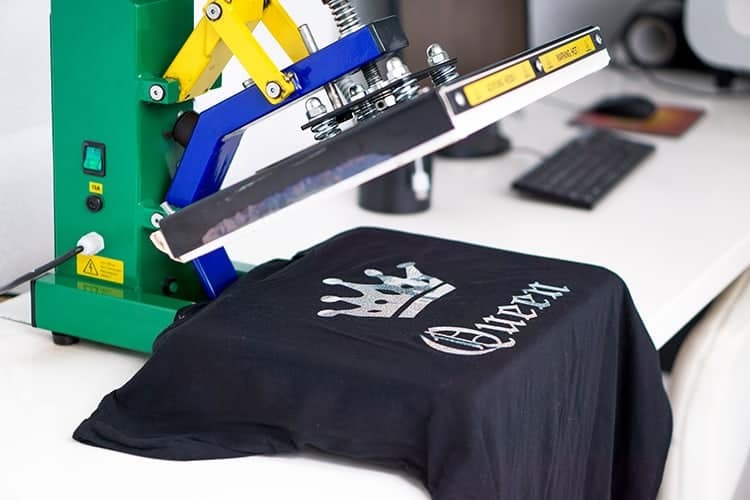 Whilst many people see heat transfer vinyl for t-shirt use only, you can in fact use in on a range of fabrics and is applied using either an iron or heat press. 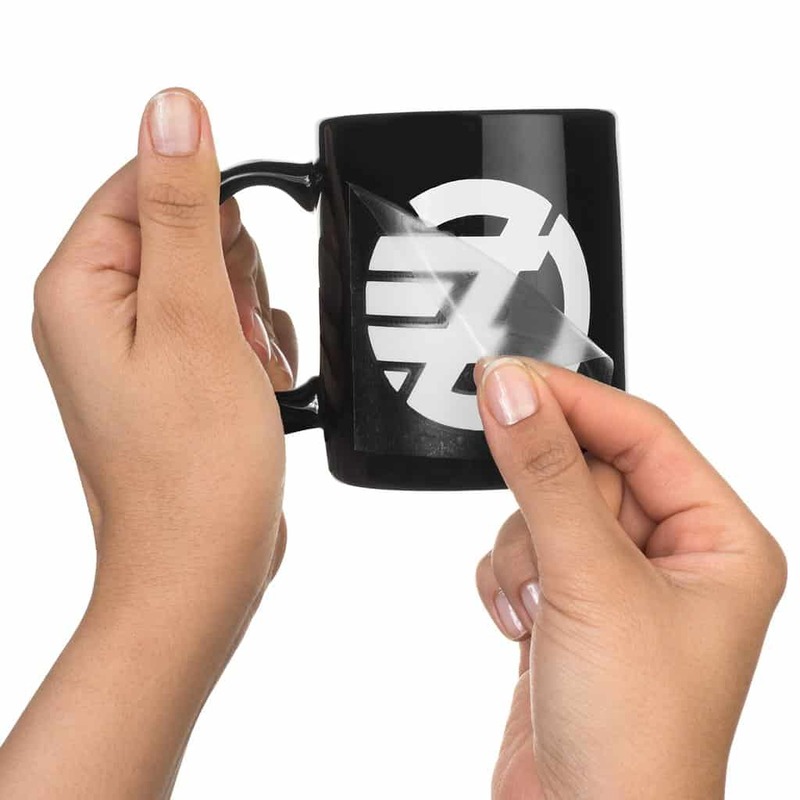 You can also use HTV on items such as mugs and glassware in order to produce some beautiful custom dishwasher-safe designs. In this situation you would need a mug press to apply heat to your items. 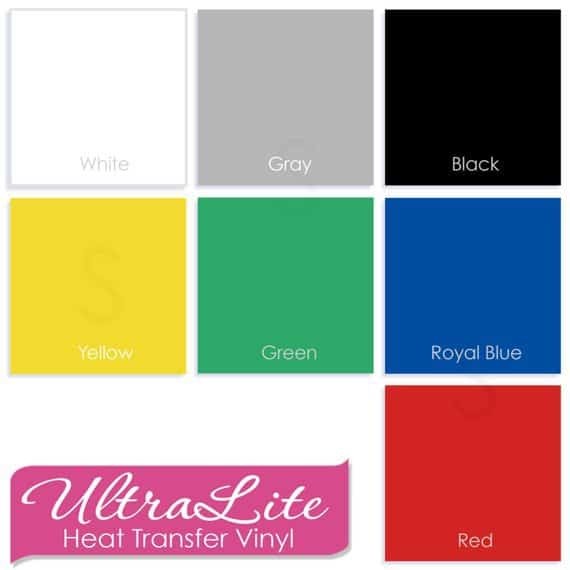 We share our favorite HTV brands below in our best heat transfer vinyl review guide. If you wish to save time, you can simply grab the best selling heat transfer vinyl by clicking the link below. What is the Best Heat Transfer Vinyl? 1. Why should you use heat transfer vinyl? 3. What is transfer tape, and do I need it? Below is a comparison chart of the top 5 HTV brands, which are mentioned in this article. You can then read my HTV reviews below featuring the best heat transfer vinyl 2019 has to offer. So which heat transfer vinyl is really truly the best of the best? It depends! It depends on how you will be applying heat. If you are using a household iron, the best iron on heat transfer vinyl for you would be either Siser or Cricut. Both of those vinyls react really well to the heat and pressure from a normal iron. I would stay away from the other brands on our list. If you are applying heat with a heat press. Well I'm happy to say that any of these vinyls will work brilliantly for you. 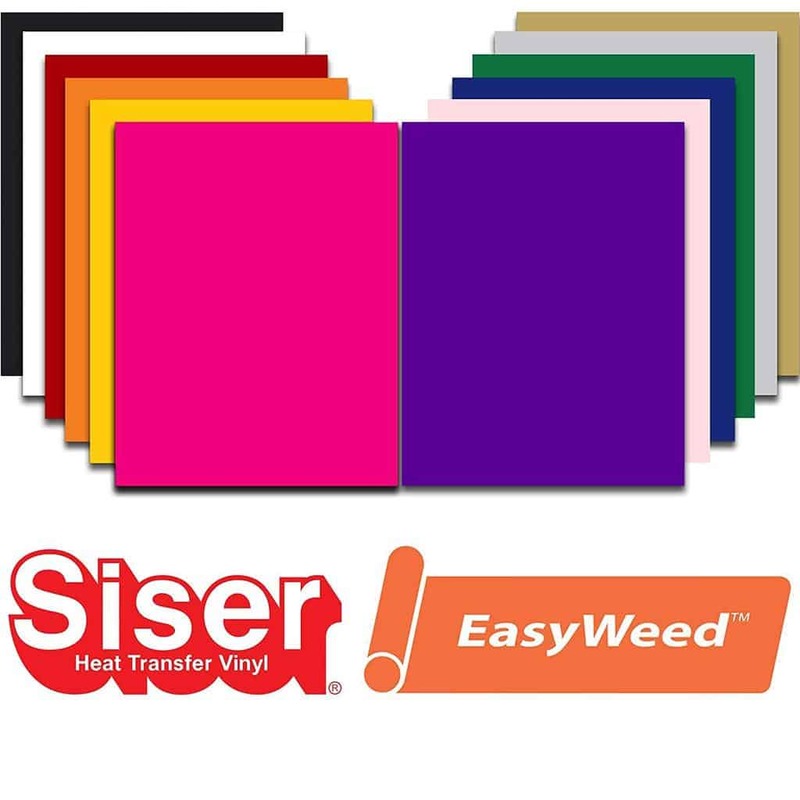 The most popular brand is Siser and their Siser Easyweed HTV always sells like hot cakes. Looking for the best heat transfer vinyl for T-shirts? Once again Siser is the clear winner for their heat transfer t shirt vinyl. Their vinyl can outlast 1000 washes and tumble dry sessions. We find them durable and fade resistant. For more information on all of these types of vinyl, hop down to the bottom of the post where we review each in detail. The best heat transfer material that you can use is vinyl. Simply put, heat transfer vinyl (or HTV), is a special type of material that allows you to transfer any design to fabric or other surfaces. As the name suggest you will need to apply heat (via an iron or heat press) in order to permanently adhere it to the surface. 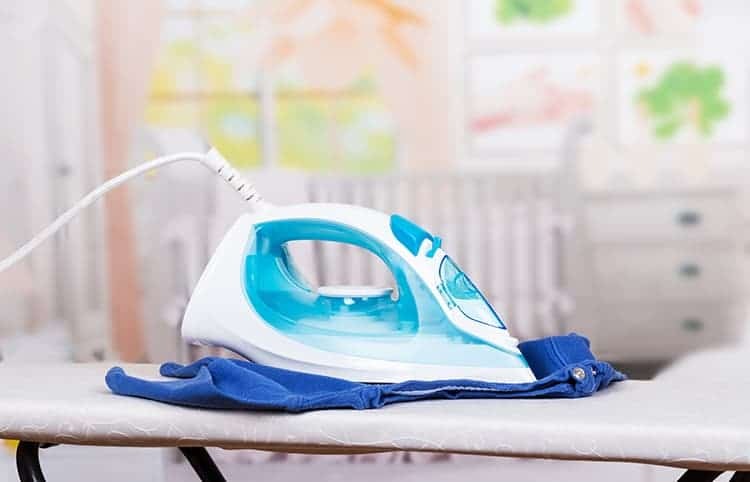 Further Reading: Read more about whether to use an iron or heat press here. Ultimate HTV consists out of layers. You will get the vinyl layer and there will be a protective clear carrier layer. 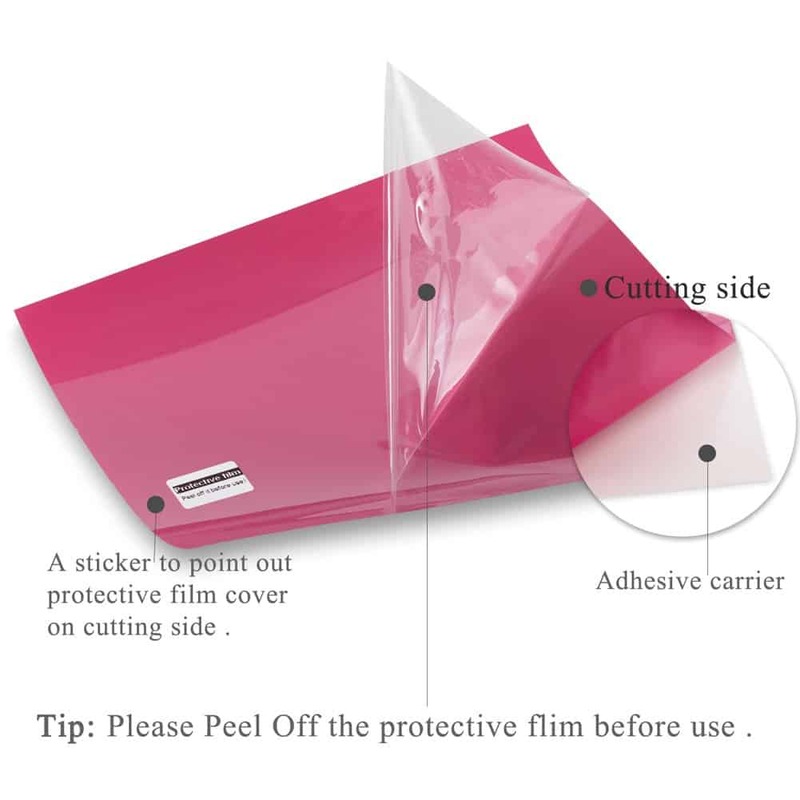 The carrier sheet is sticky and holds the vinyl in place while you cut. It also aids in transferring the vinyl to your project surface. Further Reading: Click here to jump to the bottom of the post where you can learn more about how to apply HTV. You can purchase heat transfer vinyl sheets or in heat transfer vinyl rolls. You can either purchase HTV in single colors or you might prefer to save some money by purchasing a variety color pack. 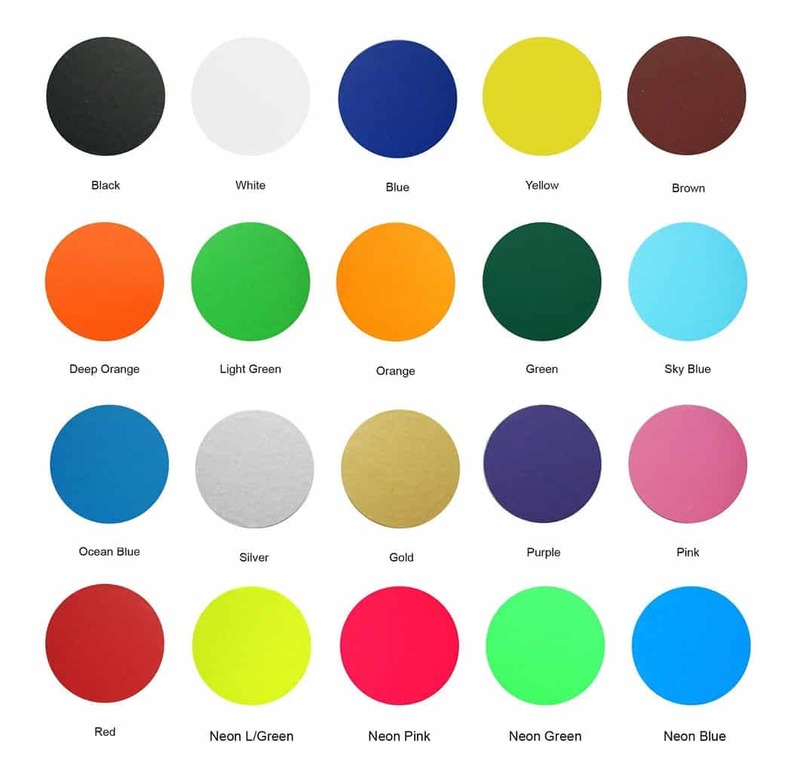 Apart from finding solid colors, you can also find plenty of speciality type vinyl, from flocked, glitter, metallic, glow in the dark and more. 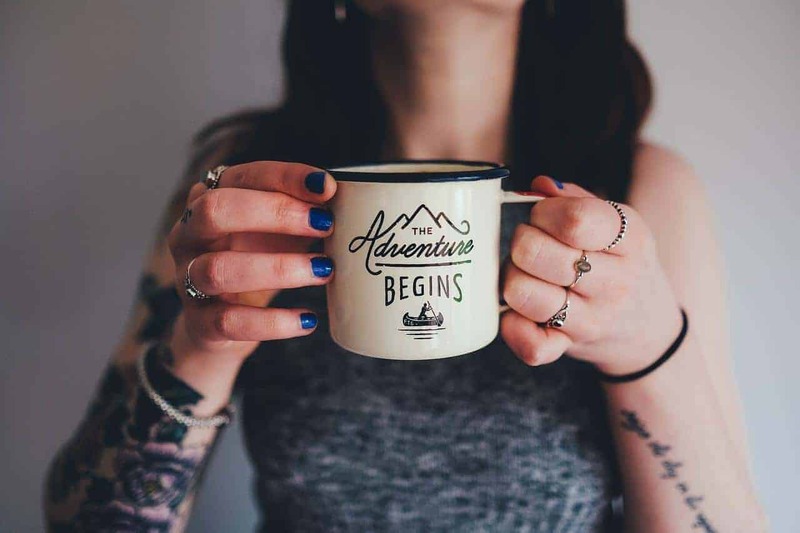 Whilst most crafters use HTV for t-shirt designs, you can apply it to other surfaces such as hats, mugs, glass, wood, metal etc. as well. The beauty of HTV is that you can wash, tumble-dry or send it through the dishwasher and it will come out looking fresh and new. So you want to whip up some custom heat press transfers, but you are not sure what brands you can rely on and trust. Not all vinyl heat transfer brands are the same. They have different features and specification. Whilst you can get some cheap heat transfer vinyl rolls on Amazon, not all of them would be worth the money. Let's have a look at some of the things you would need to consider before you make your purchase. Are you looking for a single HTV sheets, an assortment pack or bulk HTV rolls? You will of course find better value in assortment packs or HTV rolls, but if you are only getting started, you might prefer to purchase single sheets. High-quality HTV is durable, fade resistant and won't peel or crack. You really want to know that you can keep washing the shirt, ironing it and that your design will still look like new. In my opinion, there is no point in falling in love with a vinyl brand that only has limited colors or prints available. 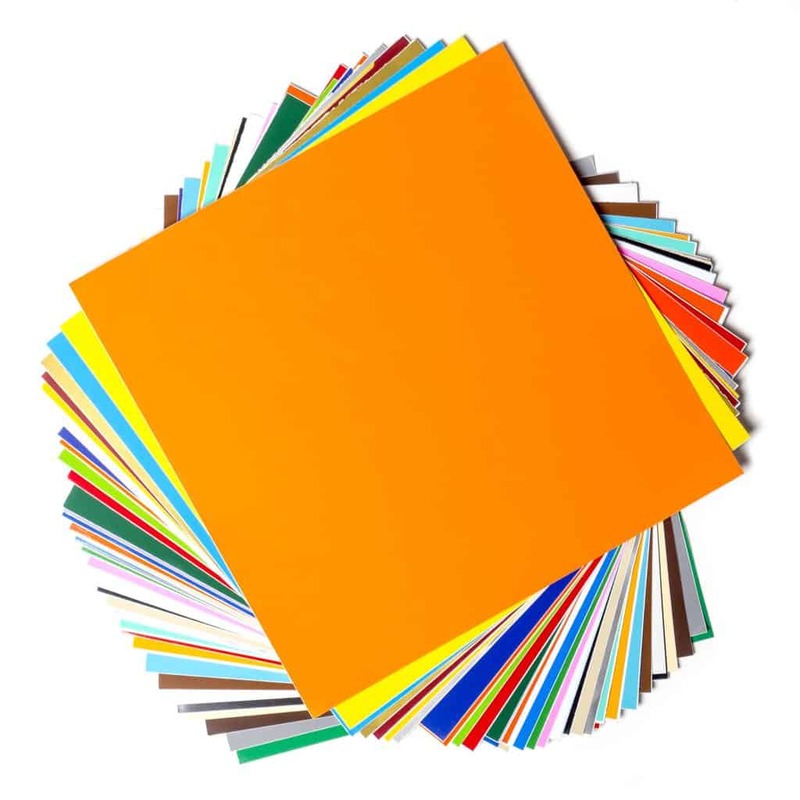 We love brands that offer a wide range of solid colors, together with speciality types. 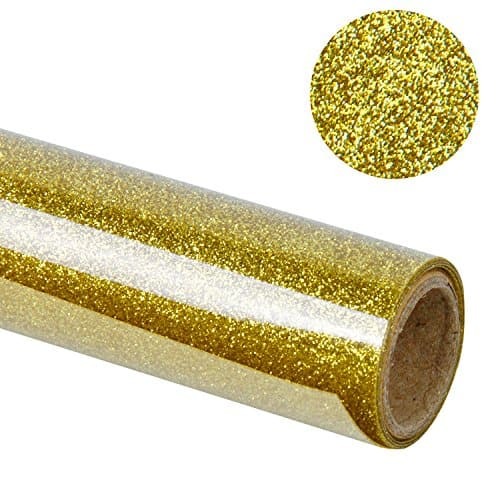 Look for one that also sells things such as glitter heat transfer vinyl rolls, flocked HTV, metallic colors and more. Pick a vinyl transfer company that have trendy colors that will make you creative in your design process. The vinyl heat transfer application needs to be quick and painless. It is important to choose HTV that is easy to cut and easy to weed. So look for vinyl transfer material that is thin, lightweight, sensitive to low pressure and requires high heat. How will you be applying heat? 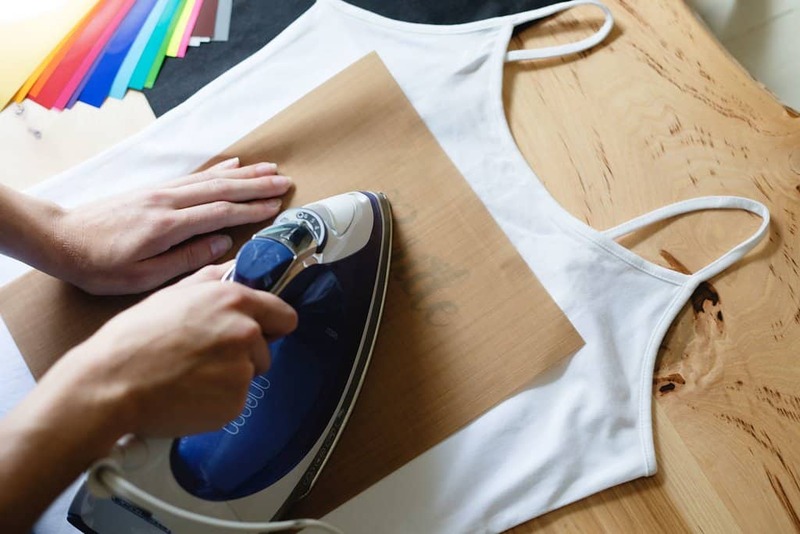 If you are using a household iron, you really should stick to the well-known iron on heat transfers. We recommend Siser and Cricut. If you are applying heat with a heat press, you can generally get away with a much wider range of brands. We highly recommend a heat press. You can find the best heat press for vinyl in our buyers guide here. It is important to purchase the right type of vinyl to match the surface that you will be adhering it to. So make sure you check out the label on your shirt - is it nylon or polyester? Or do you want to adhere it to glass, metal or wood? Ensure that the vinyl matches what it will be used for. Below you will find the best heat transfer vinyl brands. We will have a close look at the top 10 heat transfer vinyl reviews. I will outline the top features,the different types available from each brand, as well as look at its application and durability. Siser HTV is by far the most popular when it comes to quality and reliability. Not only does this brand offer the best vinyl for T shirts, but they are great for a range of other surfaces as well. Their high quality heat transfer vinyl is a polyurethane, it is super easy to work with. They are available in iron on vinyl rolls or iron on vinyl sheets. And it is a great vinyl to use for both iron-heat application as well as heat press application. The trusted Siser vinyl is so popular due to the fact that it has a pressure sensitive carrier. This means that weeding small intricate details with precision and accuracy is easy and pain free. The vinyl is much thinner in comparison to other vinyl brands. Which means that it is easy to cut, easy to weed and heat application is a breeze. 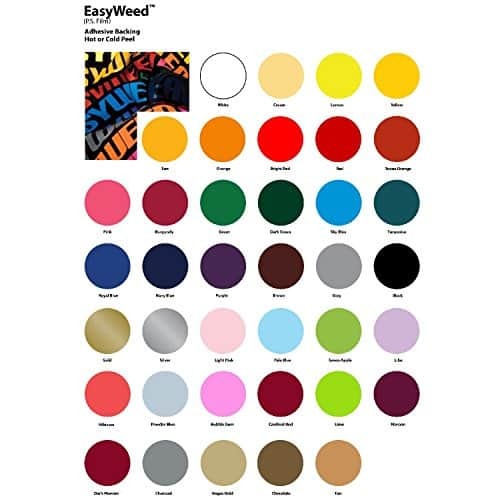 Their EasyWeed type of vinyl is in our opinion the best heat transfer vinyl for shirts, add it the fact that is 100% compatible with all fabrics and you have a winner. We love using it as our choice of T shirt vinyl, because it is durable and fade resistant and will last really well for over 1000+ washes. Make sure to stock up on their white heat transfer vinyl and black heat transfer vinyl as they are always selling out quickly. The glorious Easyweed - no need to even look further on this list. Just purchase, you won't be disappointed! It’s also extremely durable in the wash.
Siser makes the best glitter vinyl! We love the quality, the colors and the texture. You can use it on 100% cotton, 100% polyester and Poly/cotton blends. NOTE: not suitable for tumble dry. 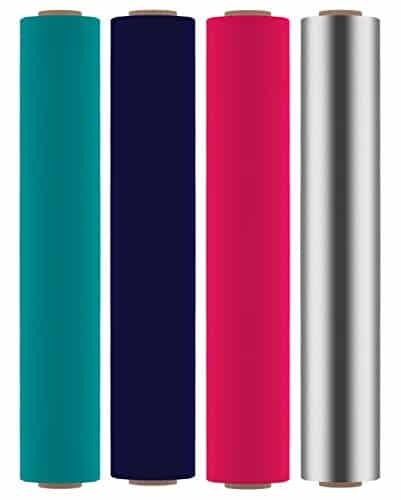 The Ultralite HTV is 25% thinner than Siser Easyweed - So thin it feels like ink. This makes it super easy to weed. It is ideal for soft goods like T-shirts, towels, leather, and other fabrics. 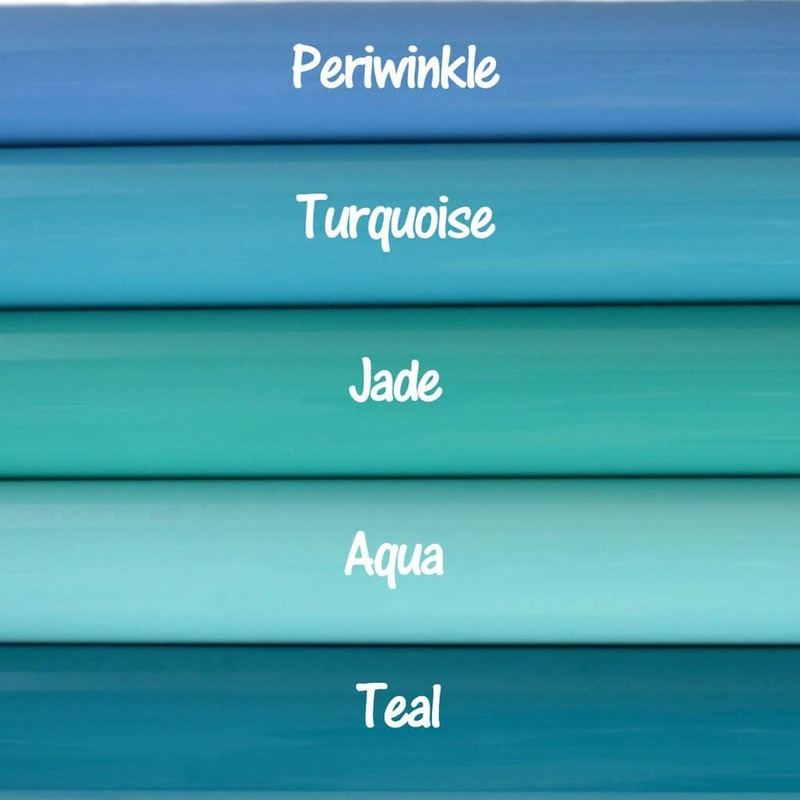 Great range of colors available, as well as the choice of sheets or rolls. Of course Cricut HTV is the best iron on vinyl for Cricut machines. 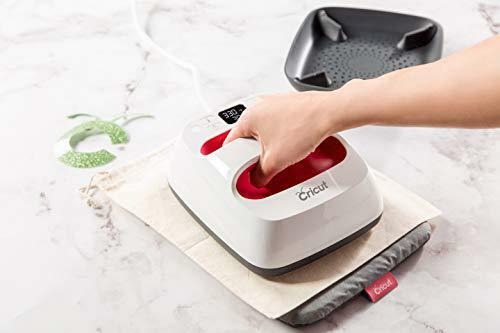 This product has specifically been designed to be cut with Cricut Machines and to be pressed with either an iron or with the Cricut EasyPress. It cuts beautifully and weeds easily. Their Everyday range works fabulously with the widest variety of base materials, including wood. 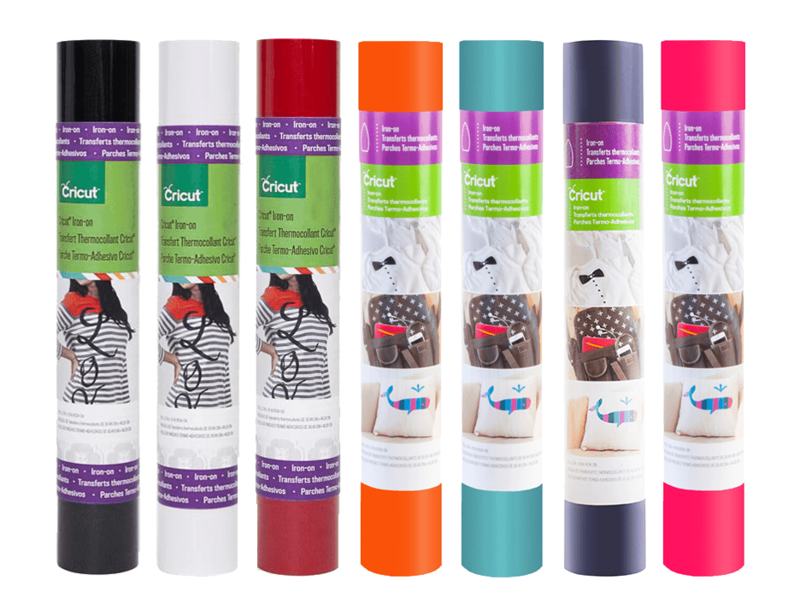 Cricut heat press vinyl might not be the cheap iron on vinyl you were looking for as the brand is pretty pricey. But you know that their products will deliver and if they don't? Well you have their StrongBond™ Guarantee to back you up. 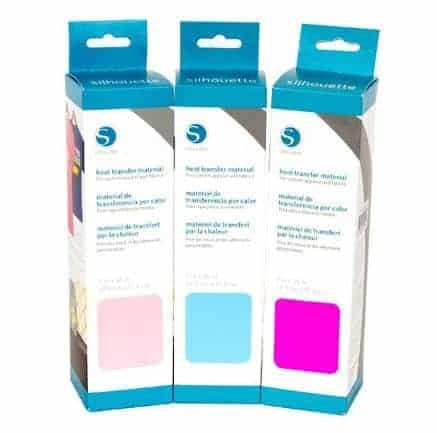 Their StrongBond™ Guarantee means that when the Cricut iron on transfer material is used as directed, you’ll should be completely satisfied with the results. If not, Cricut will replace it for free. 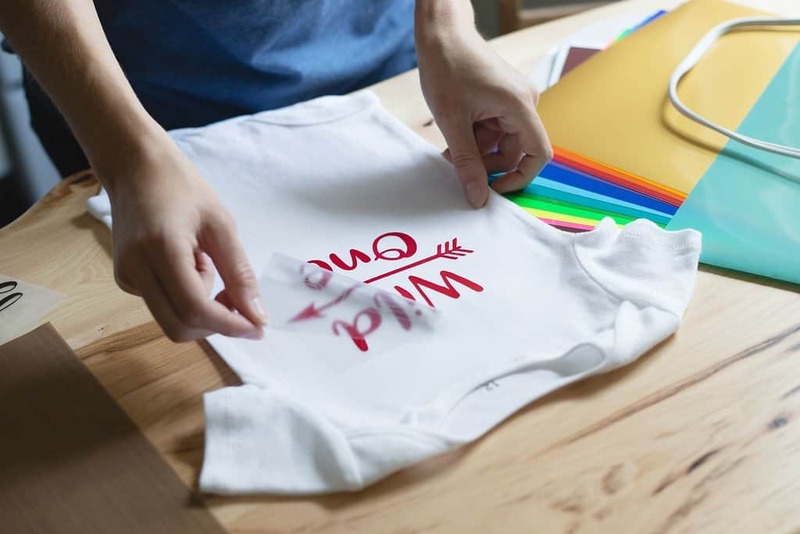 Cricut is our go to for the top choice as an iron on tshirt vinyl due to its low heat temperature threshold. 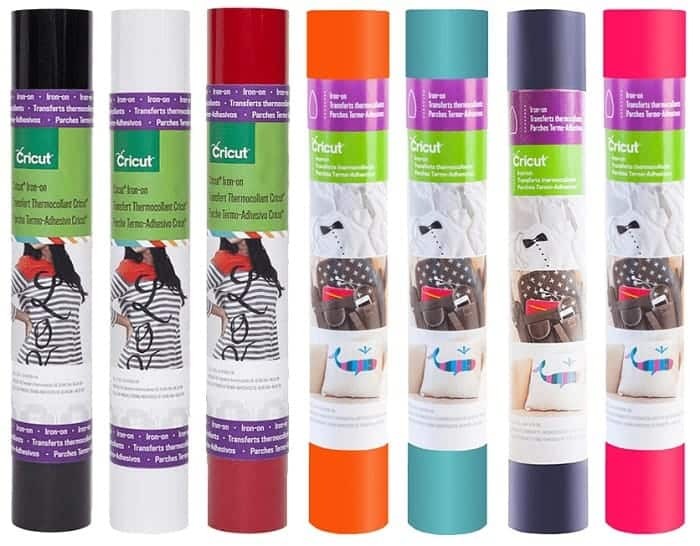 The best heat transfer vinyl for Cricut cutting machines, as well as for household iron application. The go-to iron-on material that can use for any project. 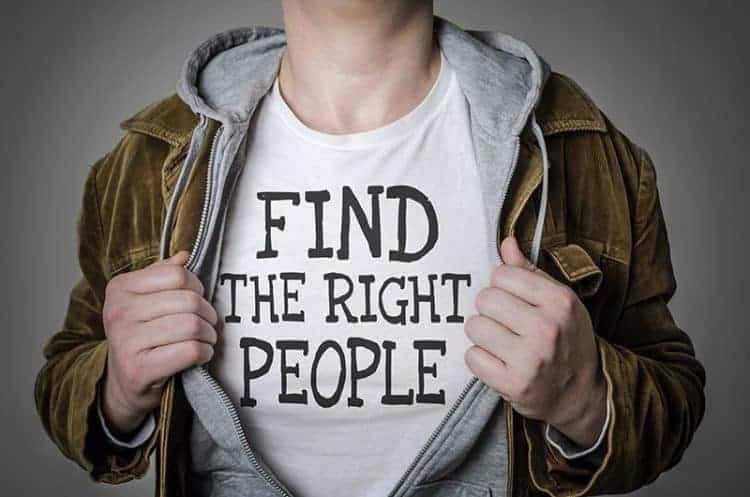 It is really easy to use and great for newbies. You can also use this range to layer your transfers. Can be used with a wide range of base materials, including wood! It is easy to weed and durable (will survive 50+ washes). 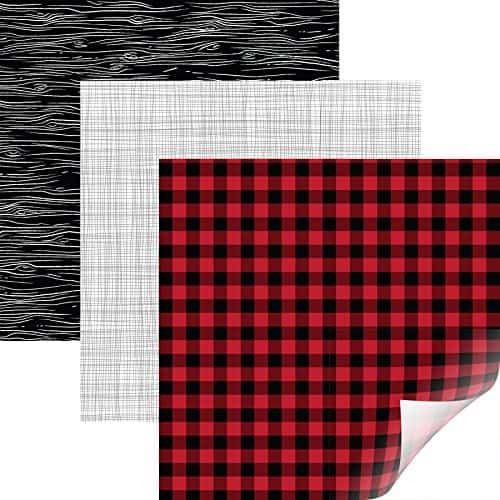 The Cricut patterned HTV packs come with 3 sheets 12" x 17" (30.5 cm x 43 cm). You will receive 3 unique, complementary patterns. 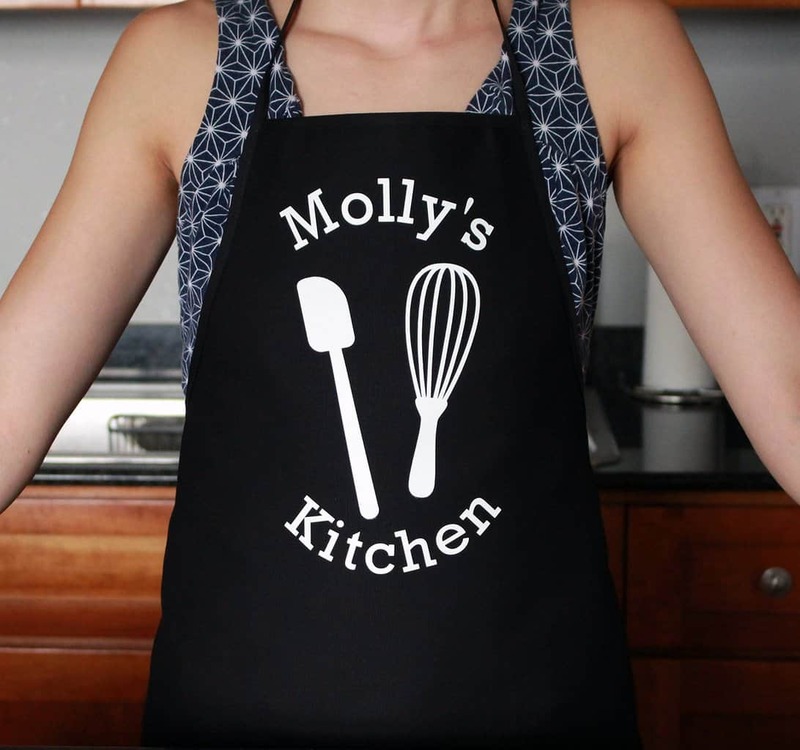 Decorate T-shirts, hoodies, baby clothes, throw pillows, tote bags, and more. So much uniqueness and so much flexibility! The SportFlex rang is really all explained in the name. This vinyl has been designed for activewear. 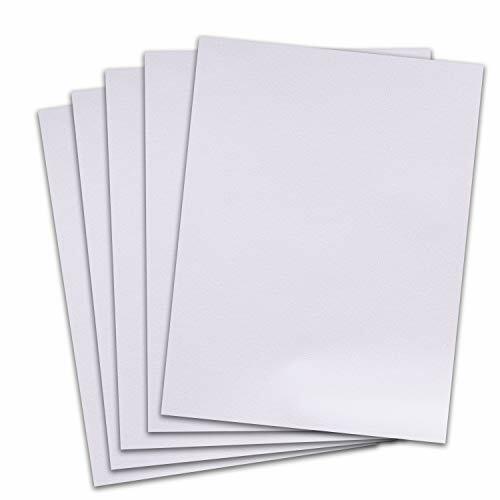 They are thin, lightweight, flexible, stretchable iron-on sheets. Each sheet measures 11.8" x 24". UnuaST has a fabulous premium heat transfer vinyl bundle on offer. 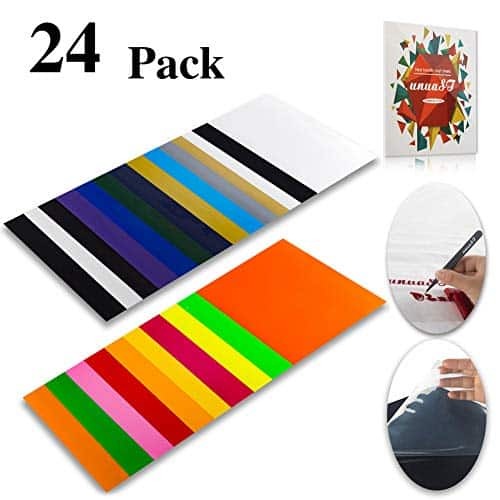 We love the vibrant & glossy colors that are included in this pack. The vinyl has a thinner textures and is easy to cut and weed. It is durable and promises to deliver the same color after 50+ washes. The UnuaST HTV starter pack includes 3 x black and 3 x white, 3 neon colors (green, yellow, red) & 15 main colors: Red, Gold, Yellow, Middle Yellow, Lemon Yellow, Purple, Silver, Rose, Grass, Royal Blue, Orange, Purplish Blue, Green, khaki and Pink. You can easily apply this heavy-duty HTV vinyl on all kinds of fabrics. They guarantee that their vinyl won't fade, peel or crack. We love their protective film, which prevents scratches and impurities from sticking to your vinyl. Great quality as a super cheap price - gotta love that! Have you heard of Fame Crafts before? We haven't either! 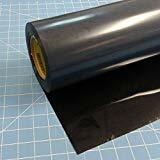 But don't let that stop you, because this bulk heat transfer vinyl pack happens to be Amazon's Choice (check it here). It also gets consistently awesome reviews from people who have purchased and tried it. 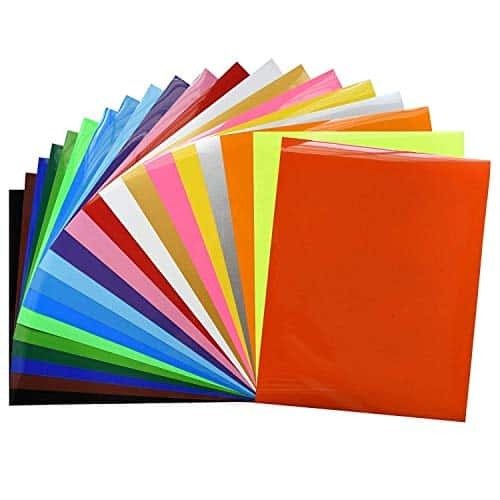 The Fame Crafts heat transfer vinyl assorted pack includes 20 assorted colors: white, black, yellow, orange, deep orange, light green, green, sky blue, ocean blue, blue, purple, pink, red, brown, silver, gold, neon green, neon pink, neon yellow and neon blue. 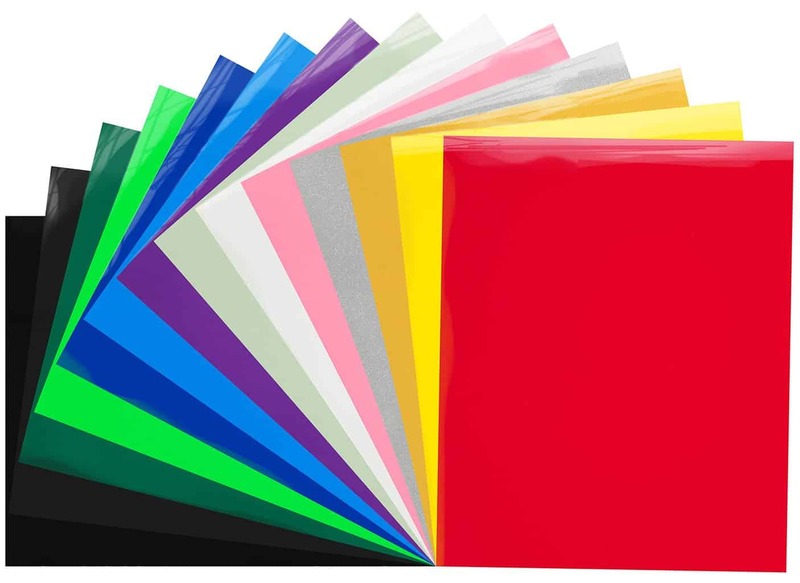 The vinyl included in these packs are thin and sensitive to pressure and heat. The combination of these features means that the vinyl will be easy to cut and weed. We love how light and durable the vinyl is. The brand proclaims that their vinyl will be able to withstand 1000 washes and drying sessions. We love Firefly Craft's vinyl. They have a wide range of colors including my favorite teal heat transfer vinyl. They also have different sizes available in sheets, T shirt vinyl rolls, as well as variety packs! We love how easy they make it to use their vinyl on both Silhouette and Cricut Machines. Not only that, but it is one of the few brands that can be used on materials such as burlap and jute products (including all the normal Nylon and Polyester applications as well). Their vinyl is gorgeous, easy to cut, easy to weed and delivers premium results. We loved the massive range of colors in the Firefly Craft regular range. The vinyl comes in lovely and large sheets: 12 x 20" and you can either purchase it in sets or in individual glitter vinyl rolls! Firefly's fuzzy flocked HTV has a furry surface. It gives great depth and texture to designs. The vinyl comes in lovely and large sheets: 12 x 20. Single sheets and packs available. Absolutely in love with the color range of the Firefly Craft high-quality glitter vinyl. The Bright Idea Supplies MAREA Premium HTV pack happens to be one that is currently marked as 'Amazon's Choice'. It comes in a nifty size: 10 x 12". What we love about this pack is that it comes with a 100% guarantee that if you aren't fully satisfied with the vinyl pack, they will give you your money back. 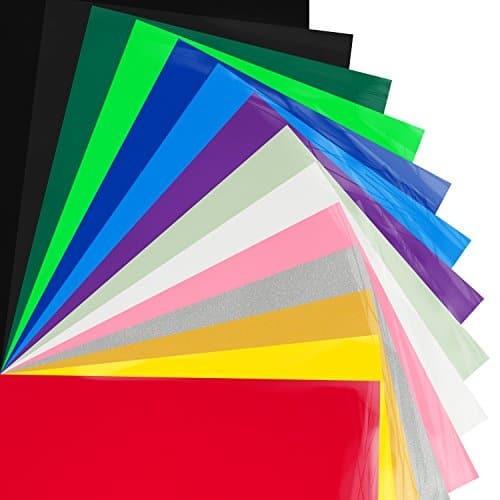 We love the range of vinyls that are included in this pack: 14 solid color bundle includes 2 sheets of black, 2 metallic sheets (gold and silver), a full rainbow of bright colors for all of your crafting projects and 1 sheet of premium Glow in the Dark vinyl. Their vinyl is made with high quality polyurethane. Their brand offers flexibility without compromising the durability and strength of the vinyl. On top of all of this, their vinyl is off course easy to cut, weed and apply. It does a fabulous job of preserving its shape and vibrancy even after 100+ washes. suitable for a wide range of fabrics such as: Cotton, Polyester, Viscose, Rayon and Cotton/Poly Blends. Durable polyurethane fade-resistant material that is durable enough to withstand 100 washes. The Rozzy Crafts range of high quality durable vinyl is another popular brand that you can try out. They have beautiful sheets of HTV that are made from polyurethane (PU). They are soft and perfect for detailed design transfers. Rozzy Crafts' heat transfer vinyl are easy to cut and easy to weed. Their vinyl has an adhesive layer which holds the design in place on the receiving garment. We love that once you have applied the Rozzy Crafts standard HTV will allow fabrics to stretch through natural movement while maintaining excellent durability. They are also durable and fade resistant and has the ability to withstand frequent washing. 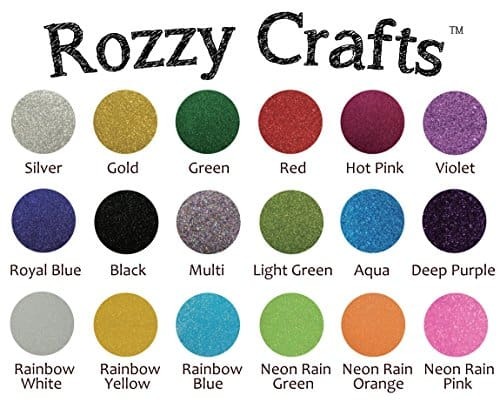 The Rozzy Crafts vinyl packs are very popular. Each pack comes with 12 sheets of high-quality heat transfer vinyl. They are all 10 x 12" in size. Easy to cut and weed. Cold peel recommended. 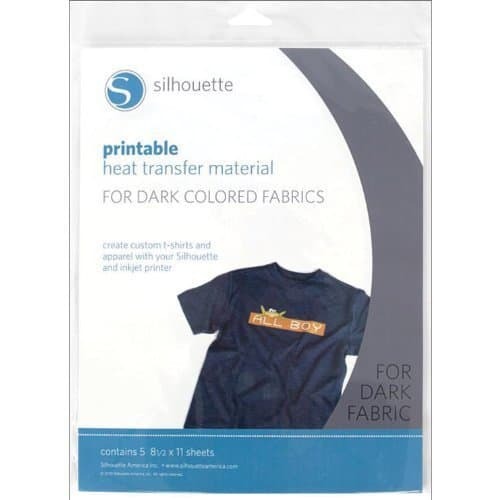 Rozzy Crafts sells their flocked heat transfer vinyl in packs of 5. The sheets measures 10 x 15". We love the soft flock finish which will give your design a velvet-like feel. White, baby blue, beige, black, blue, gray, green, orange, red and yellow. 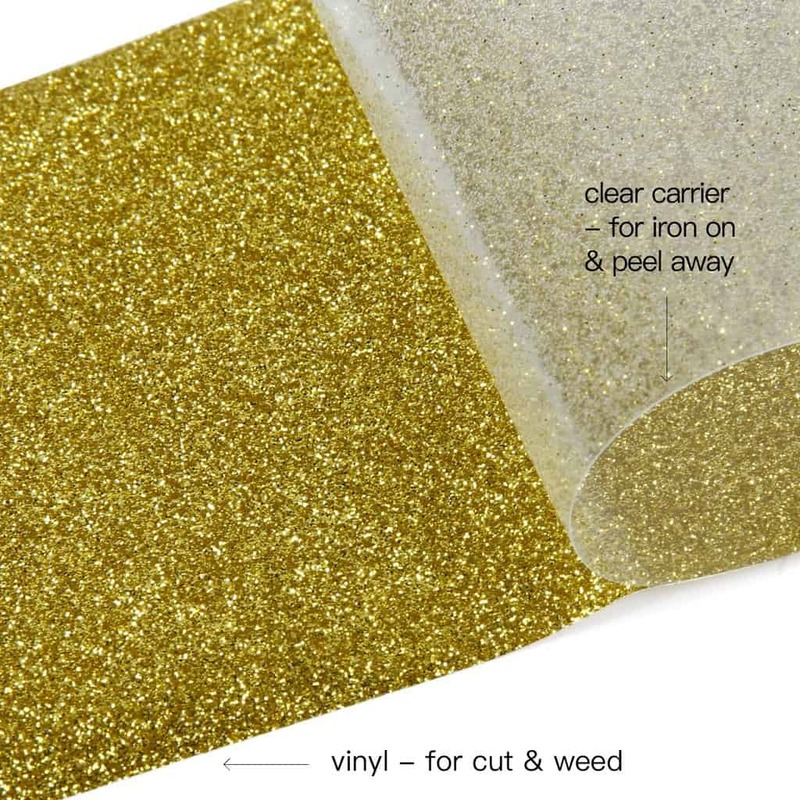 We are in-love with these glitter vinyl packs from Rozy Crafts. Each pack contains 18 sheets (10 x 12" in size). Fabulous colors range and great sparkly glitter! 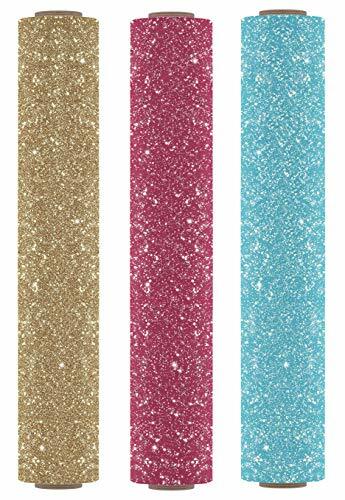 If you love glitter vinyl, you will love this divine glitter HTV pack from MiPremium. The MiPremium HTV vinyl is a polyurethane, ready-to-cut material. As with all the vinyl on our list, their vinyl is easy to cut and weed. The vinyl has a film that makes fine detail weeding easier! Their vinyl is thin and it also offers a high degree of elasticity and stretch. It is durable to withstand frequent washing and is guaranteed to not crack, peel or fade (when applied correctly). The pack comes with a 30-day money back guarantee which is truly fabulous! 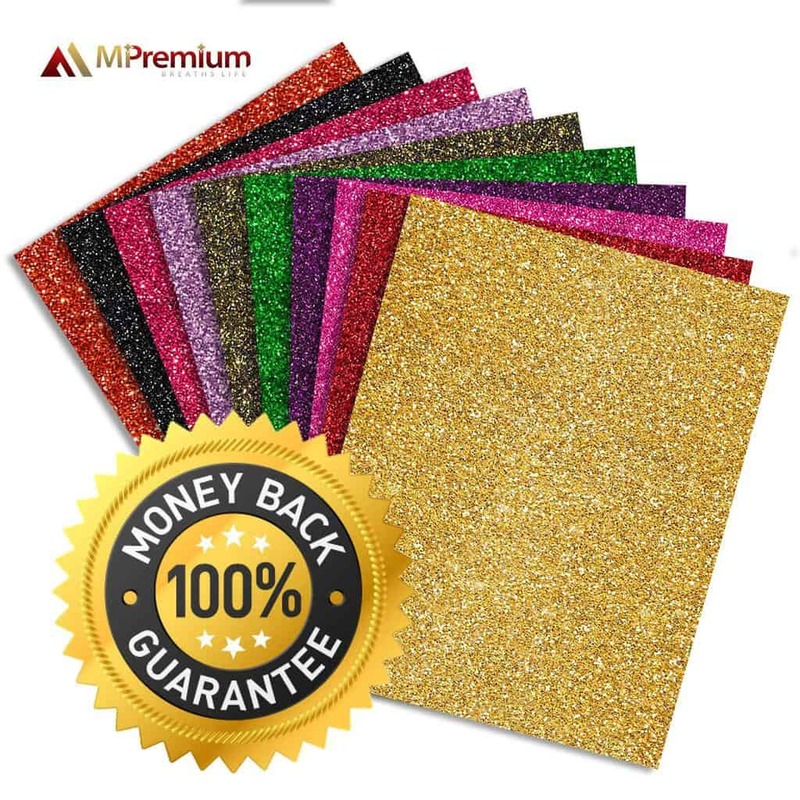 - 10 sheets of 10” x 9.8” pre-cut sheets of MiPremium vinyl in glitter. Colors included in your pack: Gold, Red, Pink, Dark Purple, Black Gold, Lavender, Green, Cherry, Black & Copper. 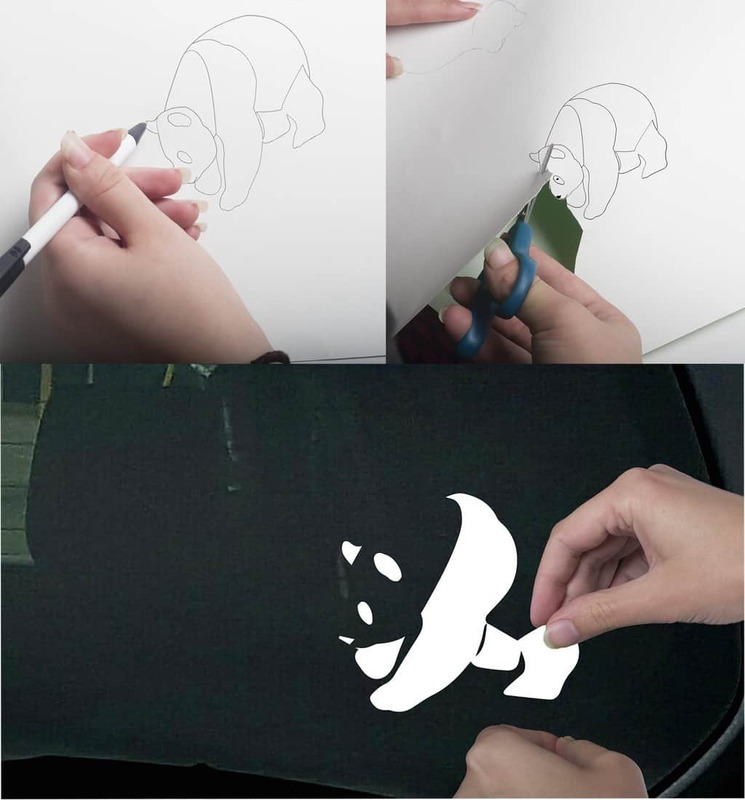 - 1 x detailed instructions guide with graphic illustrations on how to apply the vinyl. 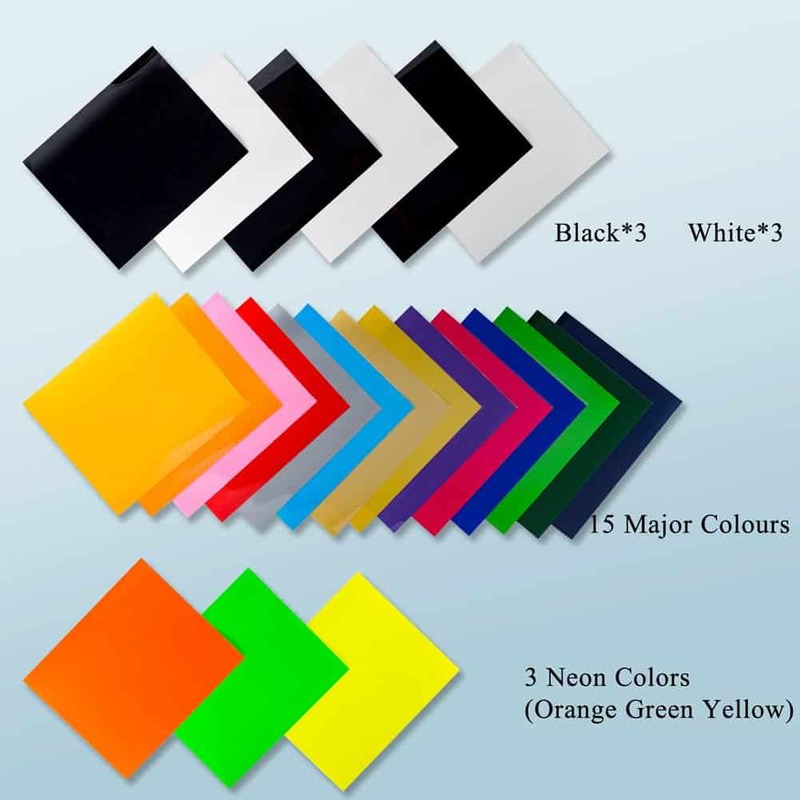 MiPremium has solid color standard vinyl, as well as neon colored vinyl for sale. 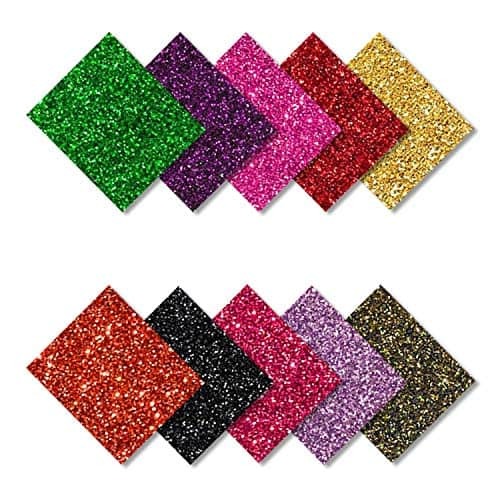 We love the Ruspera HTV glitter vinyl, because they comes in lovely large sizes of 10 x 19.5". 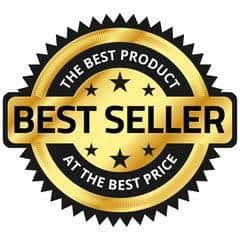 On top of that is also comes with a 100% satisfaction guarantee. So if you don't like it, you can simply send it back for a refund. The high quality heat press vinyl sheets are of course easy to cut, weed and press. 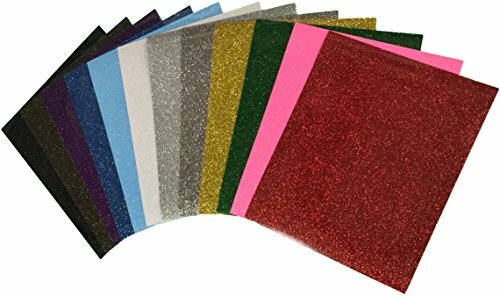 Glitter vinyl is brilliant for things such as jerseys, bags, hats and other fabrics. 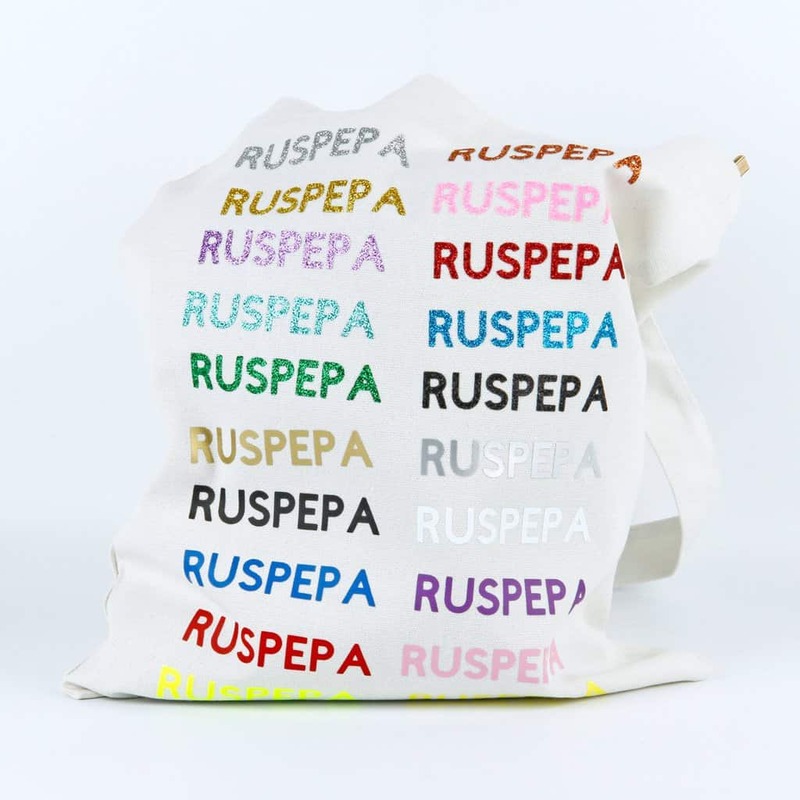 You can easily apply the Ruspera Glitter vinyl to the following fabric: cotton, polyester, blends, leather, brunet fabric, light color fabric. The vinyl is made from imported elastic PU and Glitter powder, and has a PET film. It is durable and can withstand repeat washes without fading, peeling or cracking. Looking for the best heat transfer vinyl for Silhouette Cameo machines? 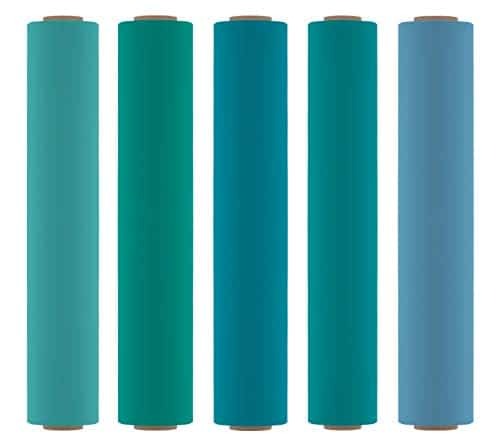 Silhouette's HTV vinyl rolls is a film material which has a heat-activated adhesive backing, so it can bond permanently onto fabric. It is fabulous for various fabric surfaces, from t-shirts, to jerseys to bags. The beauty of their vinyl is that it can be loaded directly into a Silhouette cutting machine and does not require the use of a cutting mat. We also love that this brand's vinyl includes its own transfer liner, so no transfer tape is required. One of the most popular vinyls by Silhouette is one that has a smooth matte surface. You can purchase them in rolls of 9 x 36". There are 30 colors available to choose from. 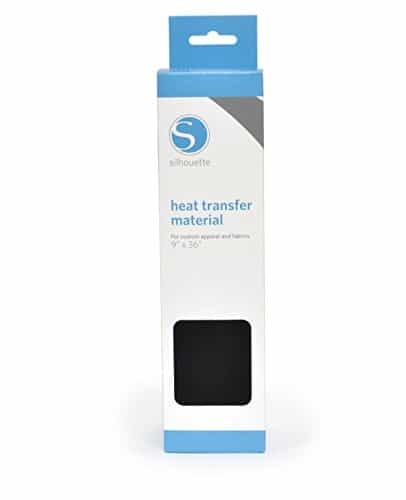 Silhouette is one of the few brands that has printable HTV on the market. So if your wish to print your design before applying it with an iron or heat press, this is the one for you. 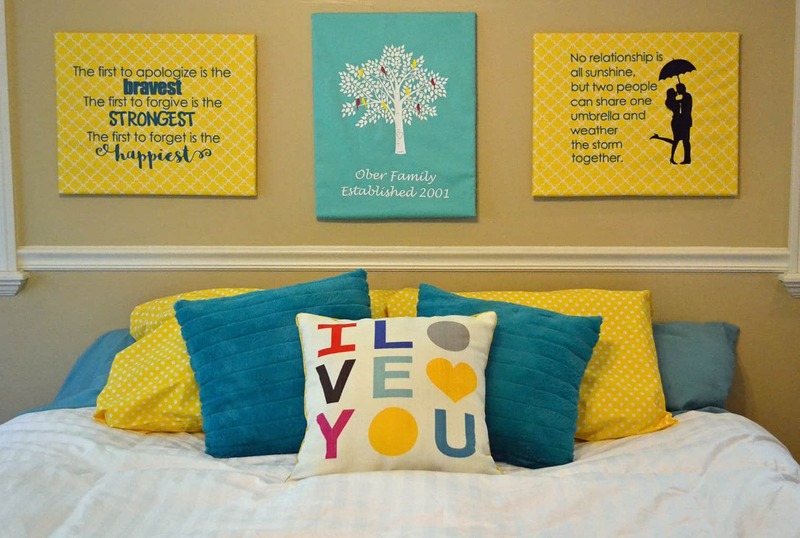 You can choose from printable iron on vinyl for either dark or light colored fabrics. Find below more helpful information that you will need to know before you start using vinyl for the first time. Heat transfer vinyl is fabulous for creating custom-made high-quality transfers. Think beyond using HTV to customize t-shirts, you can also use it to customize hats, bags, jerseys, wood panels, metals, mugs, glassware and more! Heat transfer vinyl are fabulous because they come in such a wide range of vibrant trendy colors. 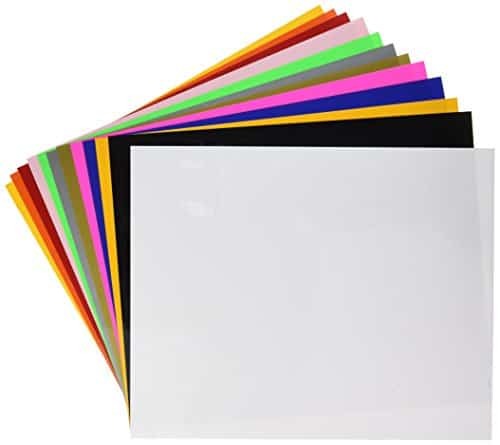 They also come in wide range of options- like opaque vinyl, metallic vinyl, glitter vinyl, holographic vinyl, glow-in-the-dark, reflective vinyl etc. So much fun! Another reason why you should use quality HTV is because they permanently bond to your fabric. If you purchase top heat transfer vinyl brands, you should be able to wash your tees and tumble dry them without having to compromise on color fading, cracking or peeling. Heat transfer vinyl is easy to use and you don't need very expensive equipment in order to apply it properly. 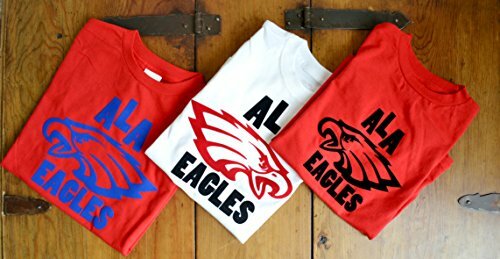 Heat transfer vinyl is more affordable in comparable to similar t-shirt printing methods, such as screen-printing and/or printing directly onto garments. But mostly, because it is an affordable way to create some truly unique custom made items. 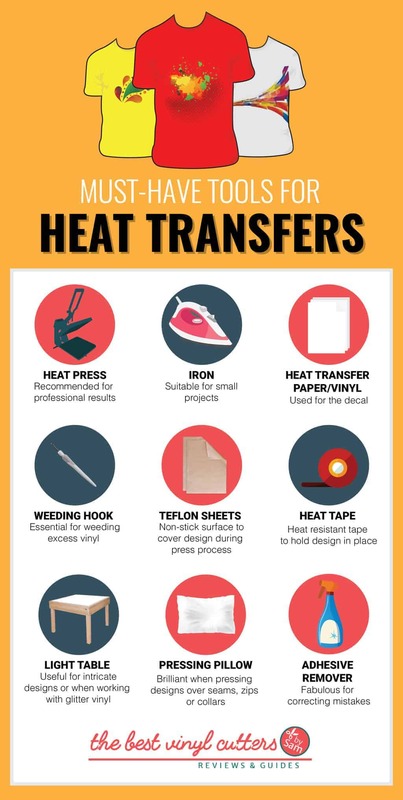 Here is a list of heat transfer tools that you need to get started. Essentially transfer tape is used to move vinyl from the paper backing to the surface that you want to transfer it to. 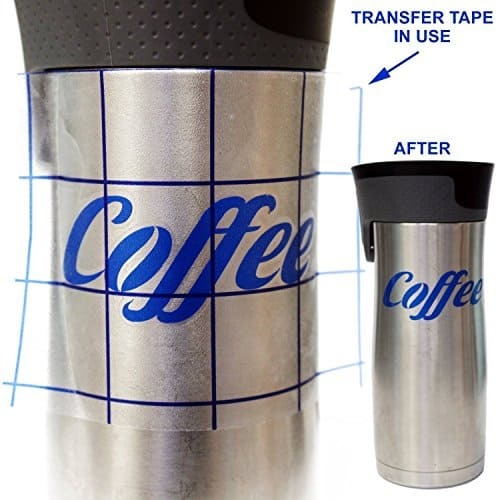 You will typically only use transfer tape with adhesive vinyl - not with heat transfer vinyl. 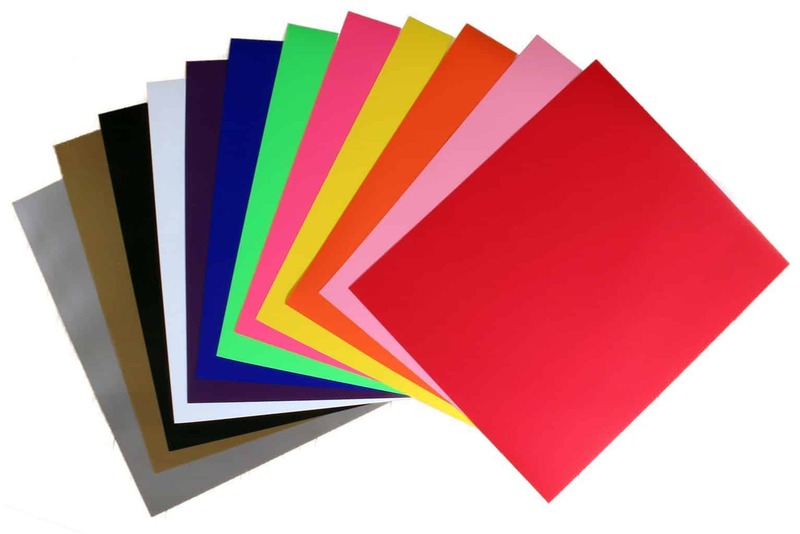 Most HTV vinyls already have a clear carrier sheet that is used to protect the vinyl during the cutting process. You will then heat up the vinyl to get it to stick to your fabric before slowly lifting off the plastic carrier sheet. It is important though to read up about the vinyl you will be using, as not all HTV has the clear carrier. You will also need transfer tape if you plan on using printable HTV, digital or inkjet transfers. Here are some quick instructions on how to use your heat transfer vinyl. You can either download pre-made graphics (we call them SVG - see our list of FREE SVG files here) or you can create your own (only recommended for advanced users). 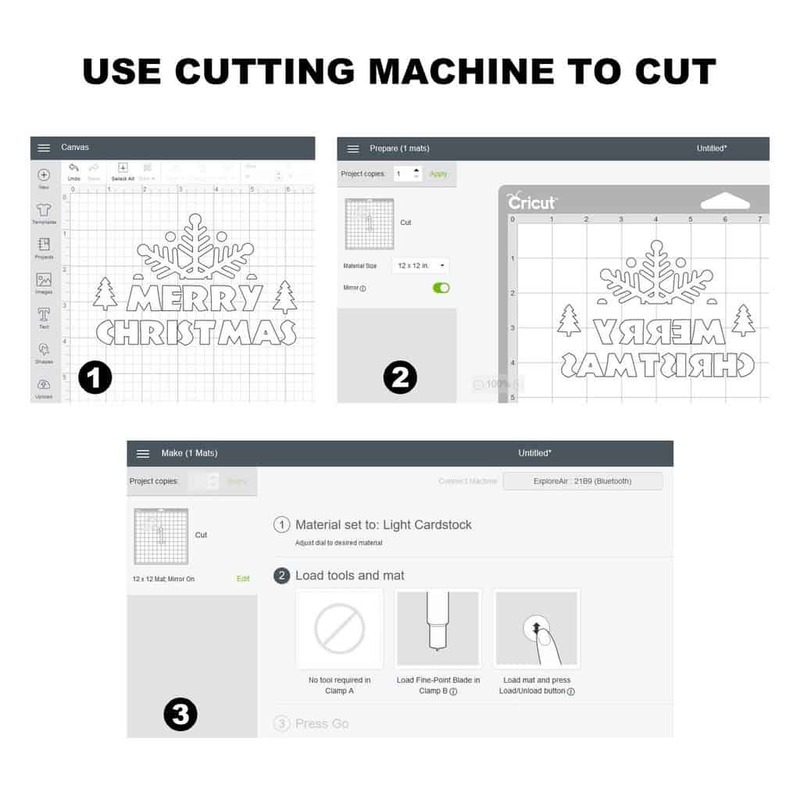 Most vinyl cutters comes with software that you can use to quickly set up your image so that it is ready to print and cut. Once you are happy with the design you chosen/created, and you have set it to the correct size, it will be time to get it printed and cut. Before you send it to the vinyl cutter, make sure to mirror-image your design. 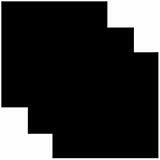 You will need to follow your machine instructions to find out how to mirror-image the graphic. Also make sure to read up on what cutting settings the brand recommends for HTV vinyl. Load the HTV into the machine. Make sure the backing of the HTV faces up. And simply let the machine to the printing and cutting! After the design is cut, you will need to weed your graphic. Essentially weeding is just the process of removing all the vinyl that we don't want/need. You can easily pull away the large part of the vinyl that you don't want, leaving the main design behind. Use your weeding hook to lift up all the smaller intricate pieces that is left in the design. Preheat your item (eg. your T-shirt) by applying heat for around 10-15 seconds. This will remove moisture and wrinkles from the fabric. Place your design on the shirt (with the plastic facing up) and place your iron or heat press on the design. Using firm pressure, hold it in place for the required length of time (check the packet instructions of the HTV that you are working with). Flip over your fabric and repeat on the other side. 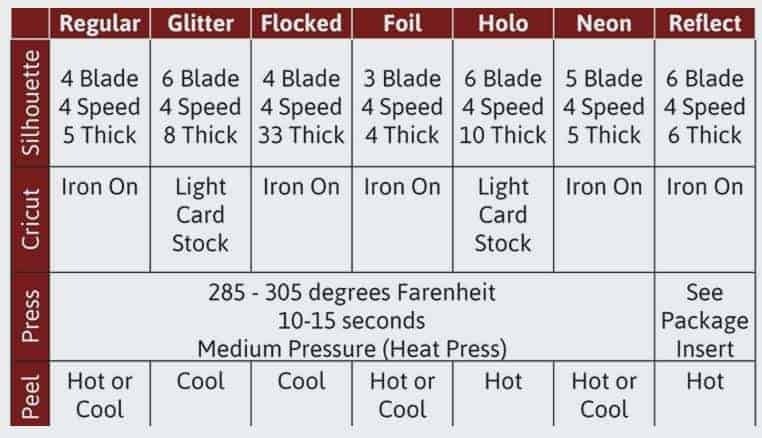 Further Reading: Click here to learn more about how a heat press machine works. Carefully peel away a corner of the backing to make sure that the HTV stuck the fabric. If you need to, you can apply more heat to the HTV to ensure that it bonds porperly with the fabric. Check the packet instructions of the HTV you are using to see whether it is a hot- or cold-peel vinyl. All that means is that you should remove the plastic whilst the vinyl is still hot, or should you wait for it to cool down first. And you now have your first completed custom HTV item! Hooray! For one last handy tip: Here is a List of the Best Places to Buy Iron-On Vinyl! 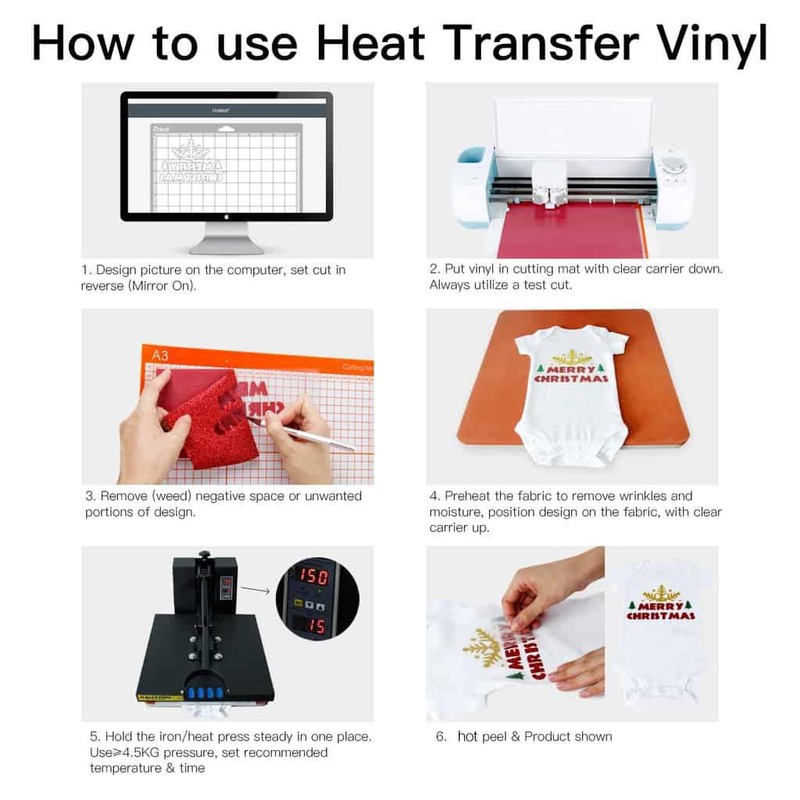 Please let us know in the comments if you found our guide to the top 10 heat press transfer vinyls useful. Thanks!